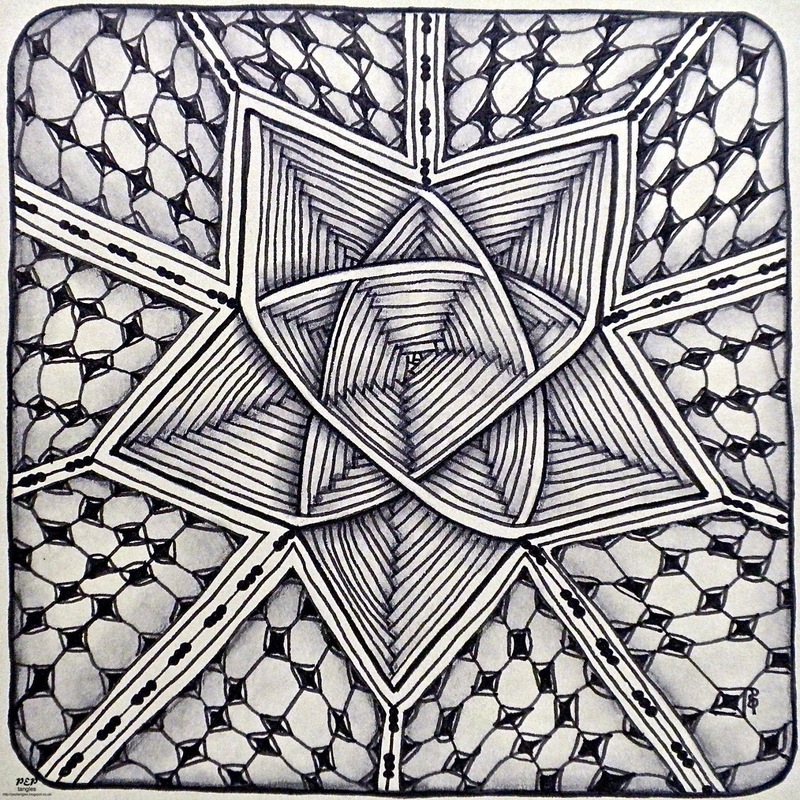 The "Seasonal" theme for the Chocolate Baroque Zentangle Group's December Challenge can be interpreted in many ways but for this tile I wanted to make the Christmas star my focus. I had briefly experimented with how Auraknot looks when varying the number of points to skip when joining the edges for the first 'aura' sequence of the pattern & decided to skip two for my tile. 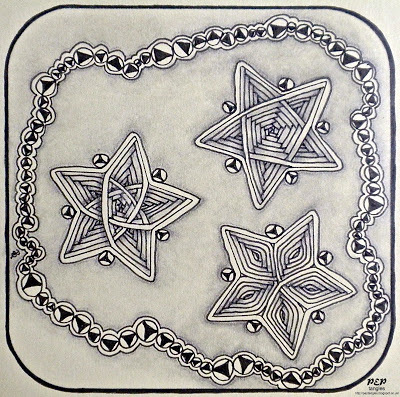 I used one of Wendy Stenton's Tempting Templates for drawing the star shape. I have some Pinflair Stepper shapes which includes a star in various sizes. 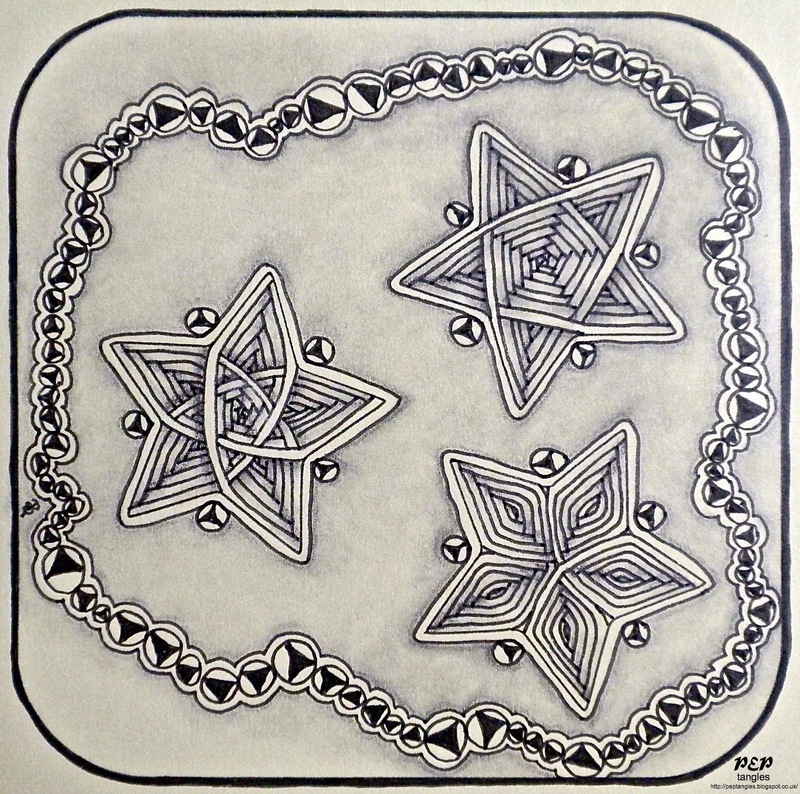 The smallest star fits comfortably onto a Zentangle tile three times so I thought I'd draw out the variations of the Auraknot pattern when skipping one, two & three points (skipping four points doesn't work terribly well on a five pointed star). Although I'd not set out to join in Laura Harms' Weekly Challenge I found the little circular tangle pattern Keenees (by Donna Hornsby) she'd set seemed to want to fit into the indented points of my stars. A garland of Keenees baubles evolved as well so not only do I have another Seasonal tile for the Chocolate Baroque theme, but I can enter Laura's Challenge too. These are both amazing in their detail and I would find it difficult to choose between the two as they are both so apt for the theme. Very interesting to see the variations in the aura knot with different 'skips' - thanks so much for sharing. the keenees works so well as a string of baubles too and the repeating aura around them ties in with the central design too. Very interesting variations on the Auraknot, they are beautiful 3d patterns and the Florz and beadline on your first tile give it even more movement. Keenees complements it so well and it definitely suits the theme. Fab tiles. Lovely, Paula :) Your auraknot stars look wonderful. Great Auraknot stars! They go well together with Keenees. You are a tangle queen, you have mastered this technique so beautifully! The design, the shading...it's breathtaking really! Paula these drawings put me into a trance. 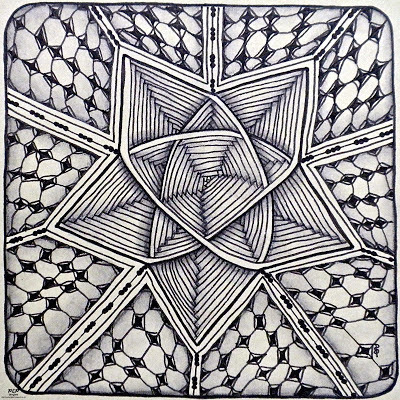 I keep looking at the shading and movement each of these intricate shapes hold. You are the queen of tangling! Love the stars....really am attracted to the second tile with the keenees! Amazing, Paula! I love the way they look like woven basket stars. Blessings! oh my Paula! so stunning and intricate - fabulous work. Mind you, not something to be doing if you have a headache .. ..! Incredible! You are so good at Zentangling.